1. What is the vessel’s ability to demonstrate history in her physical fabric? Evidence for designs, functions, techniques, processes, styles, customs and habits or uses and associations in relation to events and people. How early, intact or rare these features are may impact on significance. SUNDOWNER was built as a naval pinnacein 1912 by the Admiralty at Sheerness Royal Naval Dockyard. She was converted in 1930 into a private motor yacht. Originally 52ft (15.8m) long, she was extended to 58 ft (17.7m), converted to a ketch rig, and equipped with a centrally placed 60hp Parsons petrol/paraffin 4 stroke engine, giving her a top speed of 8 knots from her single screw. In 1936 the engine was changed for a more powerful (72 horse-power) Gleniffer diesel, giving her an extra 2 knots. A conservation programme begun in Autumn 1986 resulted in the return of SUNDOWNER to her 1930 configuration as a private motor yacht. About 40 per cent of the hull's outer planking, more than 20 oak beams, and three bulkheads were renewed. The keel was strengthened and the transom repaired. Her wheelhouse, blown off during the hurricane of 1987, was completely rebuilt. Her engine was overhauled at H M Dockyard, Rosyth, and was re-installed in 1990. 2. What are the vessel’s associational links for which there is no physical evidence? Associations with people or places. Off-ship research. SUNDOWNER is significant for having played a role in both World Wars, serving as a Capital Ship’s steam pinnace during World War One, although her exact activities are unknown. After leaving naval service, she was converted to a private motor yacht under the instructions of new owner, Commander Charles Herbert Lightoller, senior surviving officer of the TITANIC. During Lightoller’s ownership, SUNDOWNER cruised both in home waters and on the continent, including a family voyage to the Baltic, covering 3,000 miles. SUNDOWNER gained international significance during the Second World War: first in 1939 when Lightoller was asked by the Admiralty to conduct a secret survey of the German Coast, using SUNDOWNER to explore the Frisian islands; and then, on 1 June 1940, when SUNDOWNER set out from Ramsgate to assist in the evacuation of Dunkirk bringing a total of 130 persons home. In 1965 a plaque commemorating the event was placed on board SUNDOWNER by the Mayor of Dunkirk. She continued her war service as a coastal patrol vessel and later took part in a newsreel documentary demonstrating the role of her craft in rescue operations. SUNDOWNER retained her connections with Ramsgate, eventually returning there in 1986, having passed through several owners before being purchased by the East Kent Maritime Trust. SUNDOWNER later joined the flotilla of surviving 'Little Ships' on their 50th anniversary return to Dunkirk in May 1990, a voyage she repeated in 1995. She has been recorded on the National Register of Historic Vessels since 1996 and is part of the National Historic Fleet. 3. How does the vessel’s shape or form combine and contribute to her function? Overall aesthetic impact of the vessel, her lines, material she was built from and her setting. Does she remain in her working environment? SUNDOWNER was built as a war-time naval pinnace and was entirely fit for purpose, with the shape and form typical of this craft. However, she was converted in 1930 into a private motor yacht and was used for this purpose between the wars. As a naval pinnace she was designed to be functional rather than aesthetically appealing, but her conversion into a private motor yacht gave her more attractive lines. In the Second World War she also took part in several operations in this configuration. 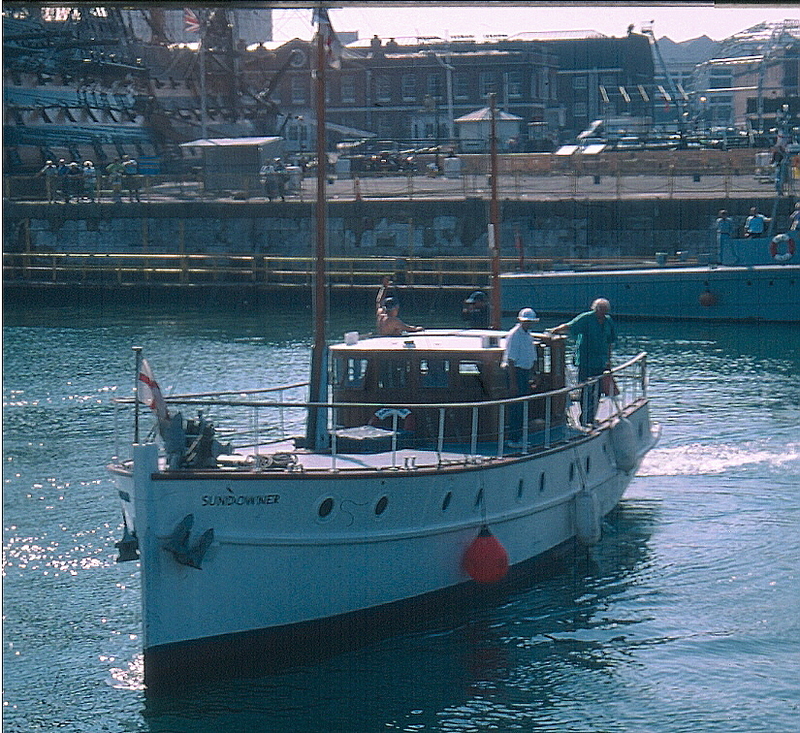 Today SUNDOWNER retains her 1930 layout and is a floating exhibit at Ramsgate Maritime Museum, in the very harbour from where she departed during the Dunkirk Evacuation, which marks one of the most significant episodes in her history. Source: NHS-UK team, 26 January 2016. 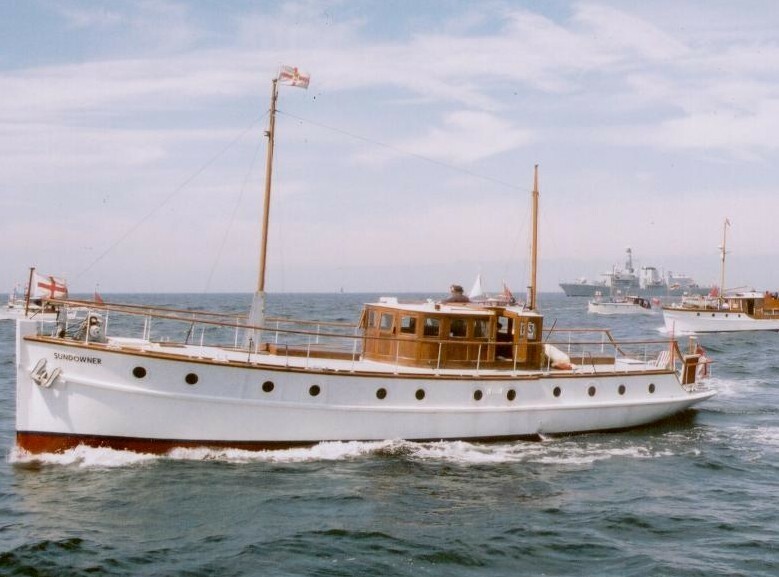 This Admiralty steam launch was disposed of by the Navy at a Sheerness dockyard sale in the late 1920s and converted in 1930 into a private motor yacht by the veteran barge builder Charles Cooper at Richardson's Wharf, Conyer near Sittingbourne in Kent. The work was carried out on the instructions of her new owner, Commander Charles Herbert Lightoller - senior surviving officer of the TITANIC. Originally 52ft (15.8m) long, SUNDOWNER was later extended to 58 ft (17.7m), converted to a ketch rig and equipped with a centrally placed 60hp Parsons petrol/paraffin 4 stroke engine, giving her a top speed of 8 knots from her single screw. The hull had cost her owner £40, the engine £100 and its reverse gear £35. 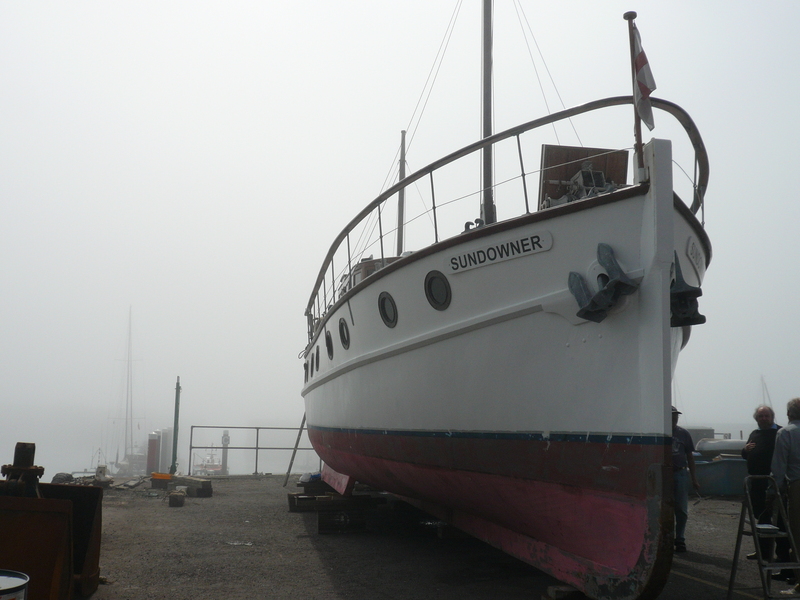 Lightoller's wife Sylvia named the transformed vessel SUNDOWNER - an Australian term for wanderer. During the 1930s, SUNDOWNER was used for family trips both in home waters and on the continent, and was a regular and successful participant in the 'Pavilion d'Or' competitive trails held at various European venues during this period. In 1936 Lightoller changed the engine for a more powerful (72hp) Gleniffer diesel, giving her an extra 2 knots and, in the summer of the following year, embarked with the family on a cruise of the Baltic, covering 3,000 miles without mechanical difficulties. In 1939, with war threatening, Lightoller was asked by the Admiralty to conduct a secret survey of the German Coast. He agreed and for two weeks, with Sylvia acting as cover, he took SUNDOWNER on a systematic exploration of the Frisian coast and islands. A year later, on 1 June 1940, with his son Roger and an eighteen year old sea-scout, Gerald Ashcroft, Lightoller - now aged 66 - set out from Ramsgate to assist in the evacuation of Dunkirk. On the way they encountered the motor cruiser WESTERLEY on fire. Having picked up her two crew and three naval ratings on board they carried on towards the Dunkirk beaches. Packed below, lying down for stability, and squeezed on deck with all boots and equipment thrown overboard, was a grand total of 130 persons, including those from the WESTERLEY and SUNDOWNER's own crew, headed back to Ramsgate where they arrived twelve hours after departing that morning. In 1965, a plaque commemorating the event was placed on board SUNDOWNER by the Mayor of Dunkirk. Lightoller died in 1952 and the family sold SUNDOWNER in 1964. After passing through several hands she finally returned to Ramsgate Harbour in 1986, the victim of a storm off the North Foreland which damaged her steering and planking. In the Autumn of that year the East Kent Maritime Trust began negotiating with her owner for purchase of the vessel. They began a process of fund-raising and restoration which finally resulted in returning SUNDOWNER to her former state. About 40% of the hull's outer planking; more than 20 oak beams and three bulkheads had to be renewed; the keel strengthened and transom repaired. Her wheelhouse, blown off during the hurricane of 1987, had to be completely rebuilt. Her engine, overhauled at H M Dockyard, Rosyth was installed just in time for SUNDOWNER to join the flotilla of surviving 'Little Ships' on their 50th anniversary return to Dunkirk in May 1990, a voyage she repeated in 1995. This vessel is a survivor from the First World War. You can read more about her wartime history by visiting our First World War: Britain's Surviving Vessels website www.ww1britainssurvivingvessels.org.uk.